Martin learnt the Violin at school. He got to Grade 6 and then put it back in it's case in order to explore other interests. He didn't pick it up again for another 11 years when Phil Preen twisted his arm and talked him into going along to a Folk Club that he'd started going to. It was at a Folk Club shortly afterwards that he got invited, along with Phil, to join Ceilidh Band "The Acme Dance Company", which Edward Reeve was forming, as Fiddler and he became fascinated by the Melodeon that Edward played. He managed to acquire one of these amazing instruments and after a few starter lessons from Edward, started to get the hang of it ...and never looked back! 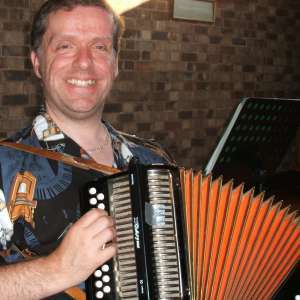 He got introduced to playing for Morris Dancing when he was invited to join Anstey Royale Chalfont North West Morris Side, firstly on Fiddle and later as Band Leader on Melodeon. He also joined Hinckley Bullockers Molly Dancers for their Annual drunken tour of Sharnford, Stoney Stanton and Sapcote. "The Acme Dance Company" eventually split up and Phil and Martin went on to co-found "The Bang on the Wall Band". Around this time, Martin met John McDonald in a Pub Folk Session and was asked if he'd like to join the "Moonshine Ceilidh Band" where he met Neil Cadwallader and Michael Scrivens. As well as playing for Ceildihs, the four of them formed "Canny Craic" performing Irish and Geordie songs and tunes in several local pubs. In 2008 Martin formed the 3-piece ceilidh band "3 Around 3" with Neil Cadwallader on Guitar and Stuart Mee on Drums. Martin has now re-joined Anstey Royale Chalfont and is band leader of Way Of The Wyrd Border Morris and the Hinckley Bullockers Molly Dancers. He has also been a band member for Sergeant Musgrave's Dance, Anstey Morrismen and the highly-acclaimed Mortimers Morris from Nottingham. As well as playing with "The Bang on the Wall Band" and "3 Around 3", Martin has guested with "Platform 3", "2 Left Feet", "Wheezle", "The Navigation Band" and "Moggy In The Wood".